When you cut the cake, all eyes and camera lenses will be on you. Your photographer will want to immortalise this moment with a photo of the event. Make sure you aren't using an old bread knife! 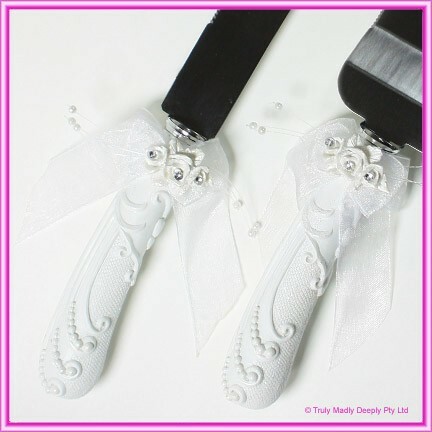 Ensure you have a lovely wedding cake knife and server set - like this one! 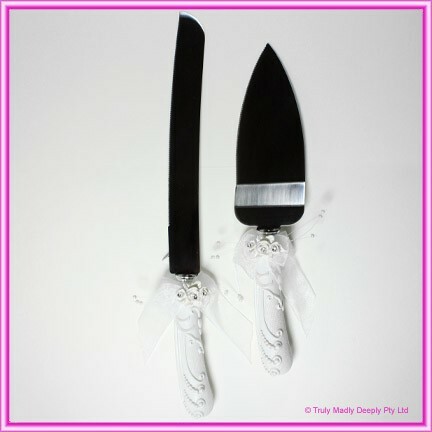 This set features a traditional white moulded handle, organza ribbon and stainless steel blades which are engraveable. The ornate handles have little roses with diamantes in the centre of each rose. Matching Toasting Glasses are available along with matching guest book and pen - see below for details.